I was putting on my makeup the other morning when I noticed a matched set of wrinkles around my mouth. Having reached the age where the mirror is can seem like an enemy instead of a friend, I am hyper-vigilant about the stories I tell myself as I gaze at my reflection. It makes all the difference in what I see. Story A: It’s the end of 2015 and I didn’t accomplish all of my goals. I feel time slipping through my fingers like grains of sand and I feel powerless to stop the flow. I don’t particularly like myself right now and the choir of judgment, criticism and frustration is singing at full volume. When I look in the mirror, all I see are wrinkles, gray hairs and a bit of sagging around my jawline. I frown at my image and wonder (rather despondently) why I look so much older. Story B: It’s the end of 2015 and I made a list of all that I accomplished this year. I have taught courses, given speeches (on a cruise! ), appeared on television, been interviewed on radio shows and even created a podcast. It’s been a productive year and I can’t wait for 2016! When I look in the mirror, I see myself as a vibrant woman eager to share her wisdom. The wrinkles, gray hairs and sagging jawline are just the physical evidence that I have lived more than 50 years on this planet. I smile at myself, knowing that I am enough. What just happened? My physical appearance didn’t change. The mirror’s surface was the same – it reflected back what was before it. The only thing different was the story I told myself as I looked into the mirror. And that story (whether it was positive or negative) caused me to see myself differently. My mirror has become my litmus test. When I see the wrinkles, gray hair and sagging skin, I know I am not telling myself an uplifting story. When I see sparkling eyes and I can smile at myself, my internal story is rocking. Stories are the meaning you attach to neutral facts. In the examples above, the physical appearance of my face certainly did not change, but I saw different things because of my story filter. Can you change your limiting stories? Absolutely. Are you willing to become aware of your limiting stories so you can change them? Silence…as crickets chirp in the background. The inevitable truth is: Only you are in control of your stories. You created them and you can change them. No one is coming to fix it. Only you can decide what stories work for you and which ones need to be changed. “But how do I change my stories? That’s exactly how I see myself!” I can hear the conversation in your head as you consider my message. I do not have enough space here to explain the how and why of the Story Alchemy™ process, but I can promise you that it works miracles. When you change your stories, you change your life. Your view of your world also changes to reflect your new perspective. 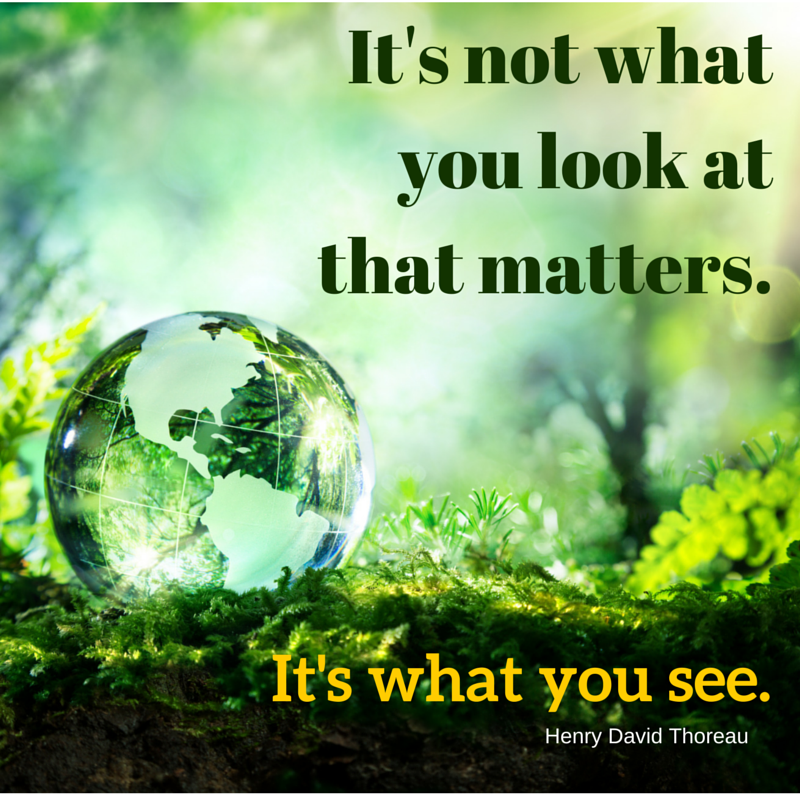 One of my favorite quotes is by Henry David Thoreau: It’s not what you look at that matters; it’s what you see. When you begin alchemizing your limiting stories, you begin to see your world differently. Why? It all starts with your inner world. Change your inner world and the outer world will also change. We live in a dualistic world of physical form, governed by the laws of time and space. Good and bad co-exist; love and hate can always be seen; joy and despair exist in the same set of circumstances. It all comes down to which story you choose as your filter. Are you limiting your view because of the choir of judgmental voices singing in your head? Or have you chosen to ignore them and turn toward the light of empowerment? It is your choice, in every moment. Your choice determines what you see in the mirror, and in the outside world. Why not choose to stand in front of your mirror with an empowering story about yourself, your life and your value? Commit to seeing the greatest version of the grandest vision of yourself and your world will change…because you have changed it from the inside. You always have the perfect litmus test to determine whether you are on track. Your mirror. And your life. Interested in learning more? Please visit KathrynEriksen.com and join my email list. Your first gift is the Story Alchemy ebook, that explains the process of returning to your authenticity. How many weight loss resolutions have your broken by the first week of the new year? Are you in that stage now, berating yourself for your lack of will power and focus? Diets, by their design, are restrictive. Deprivation and negativity are hallmarks. And many diets actually work against your body, triggering it’s survival mode. Holding on to every bit of calories and stored fat, because when you are on a diet, you can actually starve yourself. It’s like filling your car up with water and expecting it to run smoothly (or to start at all). Unlike a car, your body has its own natural intelligence. It knows how to realign and center, but it needs your help. Your body is designed to operate flawlessly, seamlessly and effortlessly. It just needs the right fuel. (Hint: the fuel is different than what you think it is). Reconnect with your Source and the negative emotions that may drive you to eat poorly disappear. Realize your innate value as a human being; the insecurities that make a chocolate molten meltdown look like it’s your last meal dissolve into nothing. You can still eat the dessert, but you will enjoy it as a treat, not as an attempt to heal your pain. Renew yourself as a holistic being, making self-care critical in your daily life. Meditation, yoga, reading inspirational materials and eating mindfully are just some of the action items that fall into this category. When you shift your focus from the outer world to your interior landscape, everything falls into place. Your thoughts stop swirling, your emotions settle and you discover what you have always known (but may have forgotten). How great would it be to live from that place? Knowing that your worth is guaranteed and that you are enough, right here…right now. If this message caught your attention and made you wonder, why don’t you join me on Monday, January 11, 2016 from 7:00 – 8:00 p.m. cst for a live webinar? You may find the answers you have been searching for, but didn’t know where to look. Let’s dance together toward a new way of being. Just think how grand the world would be if only a few people started living from the inside-out! The Heart Dancing Blog Tour continues. Yesterday’s blogger took issue with the book and gave it 3 stars on Amazon. Today’s blogger didn’t. And that is perfectly O.K. It’s all because we view everything from our own unique perspective. Beliefs, experiences and mindsets color our view of what is in front of us. We give meaning to the neutral facts of the world. The same 249 pages filled with thousands of words were read by 4 people (4 bloggers have posted their reviews – see their links below). And each one had a different reaction, based on their own unique perspective. What are you seeing today? Look with love and you will see it. Readers Muse just wrote an insightful review of Heart Dancing. As an author, it is sometimes difficult to read others’ words and opinions about your work. But I didn’t write Heart Dancing to be just a pleasant read. My overall motivation was to shake you, (the reader), awake to the enormous potential of your life and the choices you make in every moment. Your reaction to the “shaking up” may be to set down the book and move on. And that is perfectly fine. It’s just not the right time for you. But if you can set aside your skepticism…a glimmer of “something more” may shine into your awareness. Thank you Dhivya, for your honest and detailed review of Heart Dancing. It truly does depend on your perspective! To learn more about my work, please visit KathrynEriksen.com. I am hosting a Virtual Dance Party at the end of this month – the only way to learn more about it is to join my email list. Hope to see you there! The more important a call or action is to our soul’s evolution, the more Resistance we will feel towards pursuing it. Yesterday, I danced with fear. Today, whenever I recall what I did yesterday, I say a silent “Thank you” and my gratitude continues to fuel t he dance. Sounds crazy, but here is what happened. At the time, I didn’t know that fear was my dance partner. I thought of it only as resistance. That feeling of facing a wall that blocks your progress. Of knowing the exact steps I need to take but finding and following every excuse in the world for not moving forward. The laundry needed to be finished and the house cleaned. Small errands became priority whenever I thought about the work that waited for me in my office. I was running away from what I should have been running toward. The project in question is no small matter. I have just re-branded myself and my website is about to be launched with a “Virtual Dance Party.” All of the pre-launch emails, social media images and graphics, as well as the hourly clues to be posted the day of launch had to be designed and created. And every time I thought about sitting down at my computer to create these items, I met Resistance. The word is capitalized because I am also reading Steven Pressfield’s book on resistance called, The War of Art. He describes Resistance in its many forms and the parallels to my real life struggles became obvious. I met Resistance in all of its many forms and could finally identify each mutation for what it really was. Fear. For me, launching my new website is the equivalent of stepping into a new dimension. An unknown world with unexplored pathways and byways. I have listened to the Siren’s call of the creative self, but where was she leading me? Am I a lawyer pretending to be an inspirational/motivational writer and speaker? Or am I an inspirational/motivational writer and speak who used to be a lawyer? Two diverse definitions of identity, composed of the same elements, but with diametrically opposed meaning. The “lawyer pretending to be…” has safety and backups built into the very definition. I can always call myself a “lawyer” and know exactly what that label means to myself and the outside world. I played the attorney role for most of my adult life and I understood its nuances, struggles and triumphs. It was a worn, comfortable pair of jeans that I could slip into at any time. My safety net. The curse of the professional is that you expect the same results, even when you jump ship from a traditional career into something completely and radically different. For me, the dimension of the creative is a profoundly new and barely explored territory. It has its own rules and dictums, its own definition of success and its own way of being discovered. Instead of looking to external sources for education or mentoring, I have to rely on my interior world to guide me. For a linear-thinking, logically trained attorney, that is terrifying. Terror is another face of fear, which hides itself as Resistance. Reading The War of Art while meeting Resistance in real life was very enlightening. I found myself making a game of identifying all of the ways Resistance was showing up. My list continues ad infinitum, but you get the picture. Now I know what game is afoot, and I no longer fall for these ploys or diversions. Yesterday, I followed a simple process that recognized Resistance but allowed me to move forward. Instead of resisting Resistance (which only seems to give it more power), I acknowledged it as having value. Resistance was showing up for a purpose, and I decided to use it to my advantage. Instead of feeling overwhelmed (my usual pattern when I resist Resistance), I decided to focus on one small task on my “to do” list. Just one simple thing I could finish in less than thirty minutes. Nothing overwhelming or daunting. When I finished it, I celebrated for a moment, refilled my coffee, and sat down again to finish one more task. Before I knew it, my list was checked off and I had beaten Resistance at its own game. This morning, as I relished my accomplishments from the day before, it hit me. I learned to dance with fear. Step by step, moment by moment, I allowed my creative self to emerge into time and space. Without judgment or doubt; censure or criticism. I listened to the music of my heart and danced. Please join me in the Heart Dance. Resistance and fear are really signposts, pointing to the boundaries of your comfort zone. And on the other side of that defined space of familiarity…lies freedom. To discover new aspects of yourself that when expressed, bring deeper meaning to your purpose and existence. And hopefully inspires others to follow your lead. 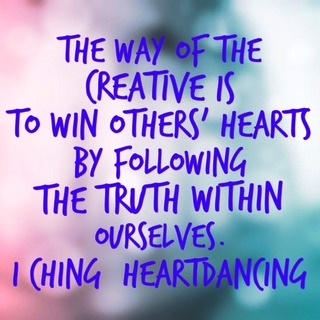 Heart Dancing – it’s the only way to live! Mountains have been on my mind lately – probably because we just came back from a trip to Mt. Rainier in Washington State. I actually devoted an entire Heart Dancing Radio show to what I learned during that trip. Please give me feedback – was this 20 minutes useful? Did I give you any new ideas that perhaps made you think about something in your life a bit differently? Did you enjoy the show? With the digital age, it gives us great freedom to express ourselves. I never thought I would host my own radio show (not in a million years!) But here I am, and I want to get better. So your feedback is very valuable to me. I truly am following the truth in myself, but what I don’t know is whether I am winning your heart??? Thank you, dear one, for sharing your thoughts, your hopes, your dreams and most importantly, your time. I am honored to be here on the planet breathing the same air, hearing the wind and knowing that there is something bigger – for all of us! I believe that life is a dance and you are one of the partners. The other one…who you are dancing with…you can guess who that is. That all affirming energy that surrounds us, imbues us with love and supports our efforts to become more. When you begin to make choices to dance, your life reflects those choices back to you. Take a moment to listen to my interview with Julianna Ricci, the Energy Coach, as we visit about life, energy and dance.